This Saturday, Kathy and I will be doing a walking tour of Greenmount Cemetery in Baltimore. I had previously done this tour about a year ago but it was very disorganized – by myself. I roamed around aimlessly, searching for famous people among the 9,000+ graves. This time we will be part of a tour given by historian Wayne Schaumberg. Some of the more notable headstones I hope to see are of Johns Hopkins, Enoch Pratt, John Garrett (B&O Railroad), Bodine (photographer), Booth (performer and assassin), Mayor Swann (Swann Lake which became Lake Roland in Robert E Lee park which is now Lake Roland Park) and Mayor Chapman (Lake Chapman, which is now Druid Lake) The Findagrave website lists all the graves. 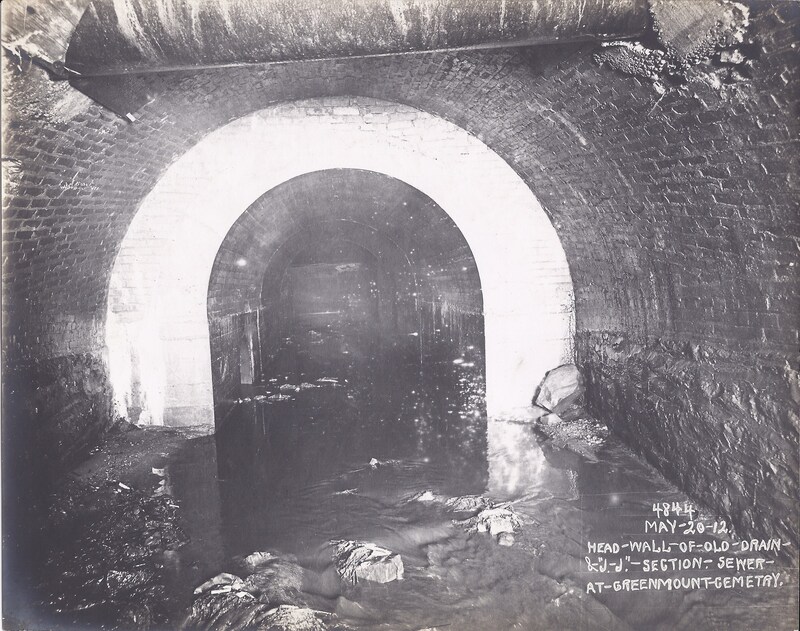 1866 – We (Commission) constructed a wall on Greenmount Ave to Hoffman and extended the tunnel under Hoffman. Then made the necessary lateral sewer and inlet to carry off the surface water from the avenue (Greenmount). It is a great improvement for the Cemetery Company. 1887 – Monument to Hon. John Lee Chapman, ex-mayor – By Ordinance No. 105, approved October 10, 1887, the Mayor and City Commissioner were directed to have a monument constructed and erected in the lot where repose the remains of John Lee Chapman, one of the mayors of Baltimore; and to contract with the Greenmount Cemetery Company to keep the lot in good and proper order forever. Under this ordinance a contract has been made with Messrs. Bevan & Sons for the construction and erection of the monument at a cost of four hundred and seventy-five dollars, the plan presented by them having been approved. The contract will be made with the Cemetery Company in due time for keeping the lot in order. 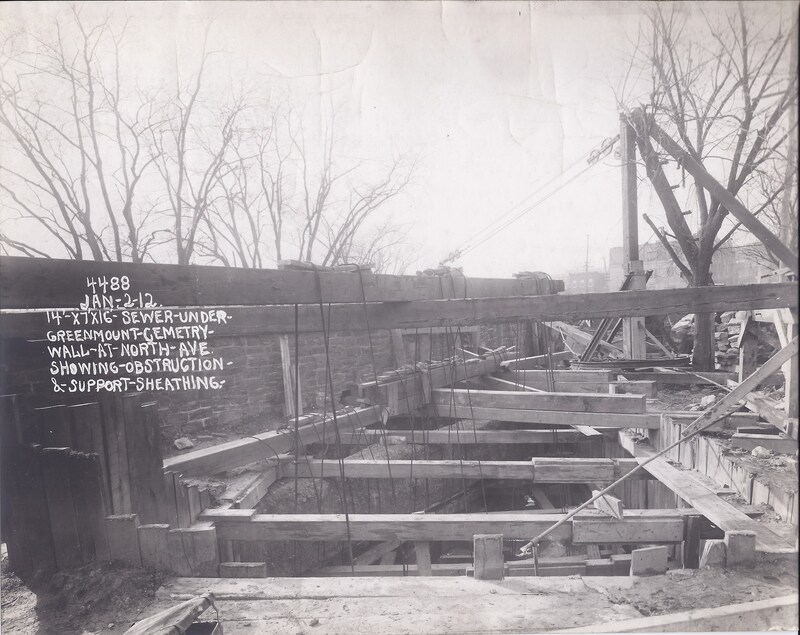 1906 – Tablet to commemorate the beginning of sewer construction. 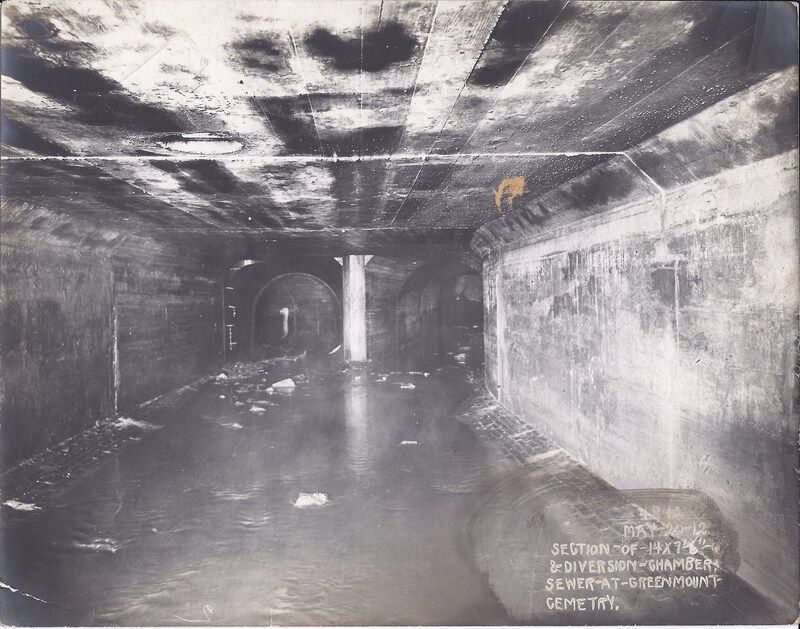 On November 20th the Chief Engineer was authorized to design a suitable tablet to commemorate the beginning of sewer construction at the intersection of Ensor and Lanvale streets; the tablet to be placed in the face of the wall of Greenmount Cemetery, which is only a few feet from the point at which ground was broken for the work. The Chairman was requested to obtain permission from the Cemetery authorities to insert the tablet at the point named. The Chairman accordingly communicated with Mr. John A. Whitridge, President of the Greenmount Cemetery Company, and obtained permission from him to place the tablet as desired. A suitable tablet of bronze has been designed and will be placed in position as soon as completed. 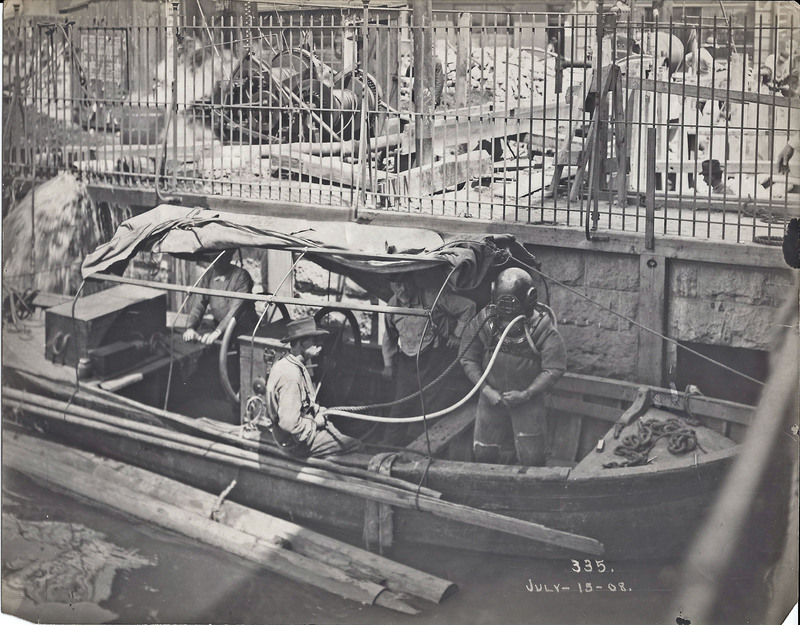 1911 – More photos of alley work and obstructions. 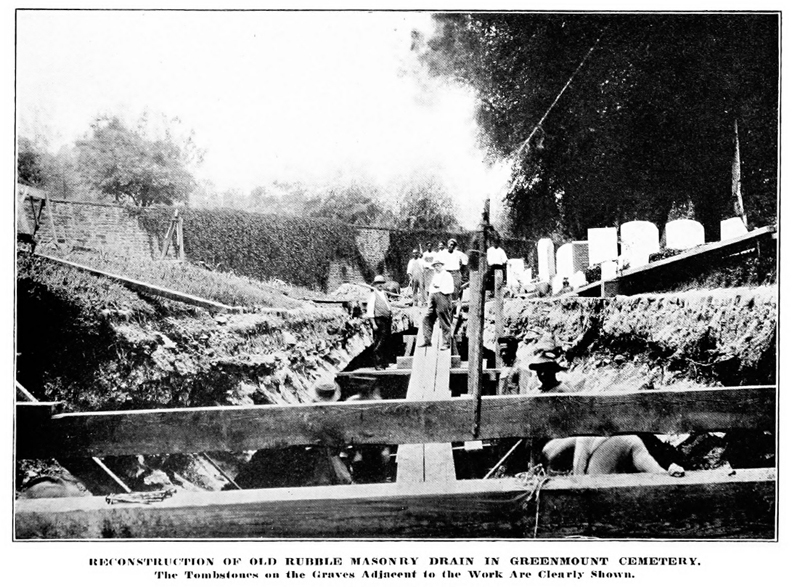 Photograph of reconstruction of old rubble masonry drain in Greenmount Cemetery, showing gravesites. Looking at the maps from back then, I was amazed at how close the Jones Falls is to the cemetery.